A rather pretty plant, about six inches tall, not rough and harsh like most kinds of Oreocarya, for the pale grayish-green stem and leaves are covered with white down. The flowers are quite pretty, about three-eighths of an inch across, with white corollas, with yellow crests in the throat. This is found as far east as southern Colorado and New Mexico. 0. setoslssima is quite tall, growing in the Grand Canyon, and has a large cluster of small white flowers and is harsh and hairy all over, covered with such long stiff white hairs as to make it conspicuous and very unpleasant to touch. Chinese Pusley-Heliotropium Curassavicum Oreocarya. muiticaulis. VERBENA FAMILY. 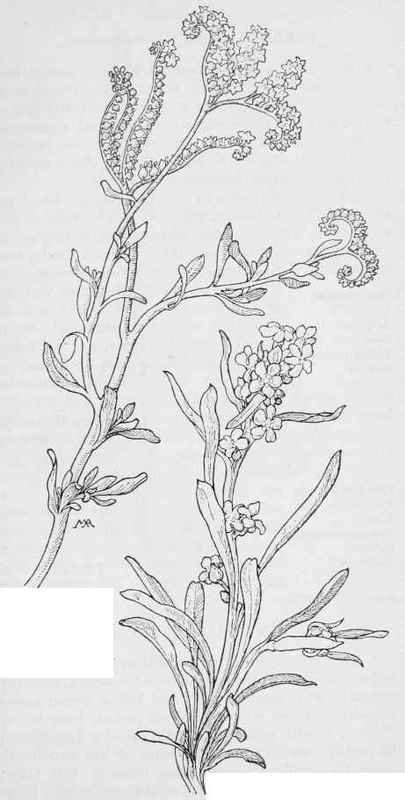 Verbenaceae.